Today's "recipe" is a very kid friendly, school lunch approved favorite. I use the term "recipe" lightly because it is more of a method than a true recipe. I think almost everyone knows how to make a PB&J sandwich. In the freezer section of any grocery store, you will find boxes of various flavors of Uncrustable sandwiches. But, they are expensive. They are essentially slices of sandwich bread with peanut butter and jelly nestled inside. 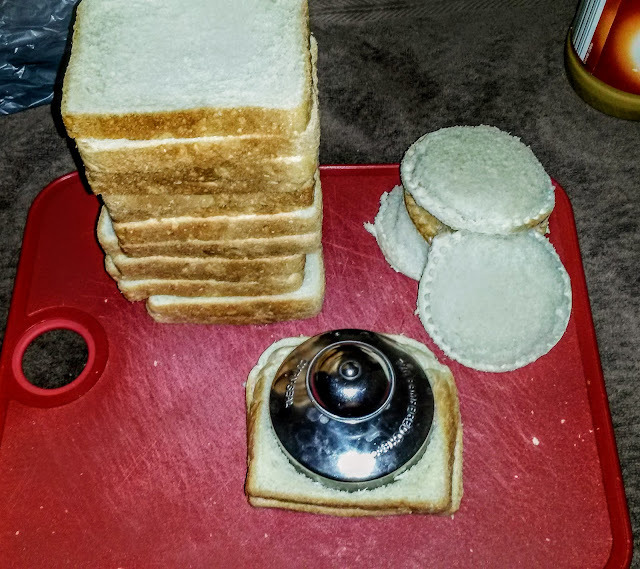 The ends around the sandwich are pinched off so that the filling stays within the pocket, making for a much less messy PB&J alternative for toddlers and kids to enjoy. 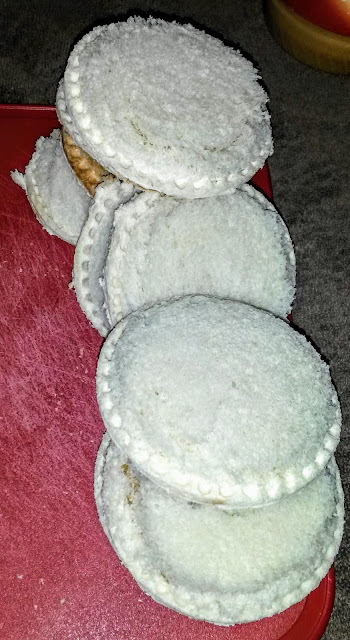 In order to make these Uncrustable knock-off's, I have used a Pampered Chef sandwich maker. Here is a link to the version I used Pampered Chef Cut n Seal. But, there are tons of other options on the market that can do the same thing. You can even just use a circle cookie cutter, or any shape for that matter. Think hearts for Valentine's, 4-leaf clover for St. Paddy's, or even a Christmas tree for Christmas. The possibilities are endless. Making these sandwiches is super simple. And the flavor combinations can be whatever you have handy in your pantry or whatever your kids love best. Any nut butter and jelly flavor combination you desire. For each sandwich you will need 2 slices of bread. 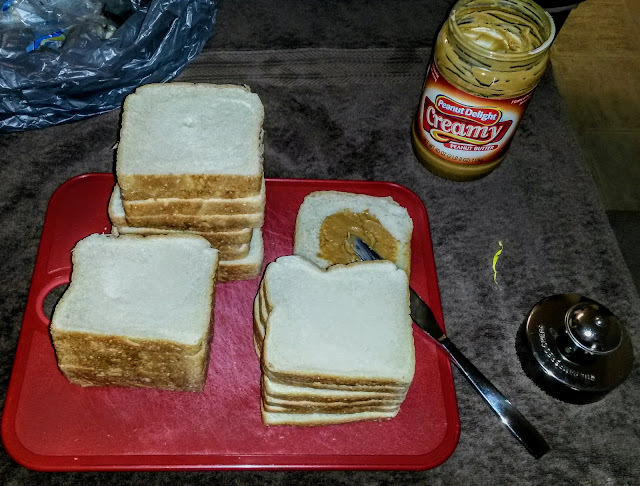 Spread peanut butter on both slices of bread. This keeps the jelly from penetrating the bread and making the sandwich soggy. Next, spread a small bit of jelly over one of the peanut butter sides. Place the bread slices together to form a sandwich. 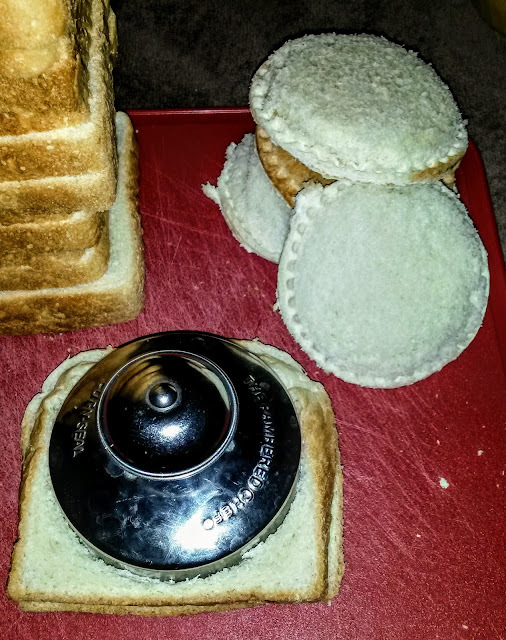 Then, you are going to take your sandwich cutter of choice and place it over the top of the sandwich. Press down firmly to cut the shape out. It should crimp all of the edges shut at this point, making a nice PB&J sandwich pocket. I usually make these in bulk, making 2-3 loaves of bread at one time. Once I have all of the sandwiches made, I store each one in an individual sandwich sized Ziploc bag. Then I place all of the individual bags in a large gallon sized Ziploc which I store in our freezer. When we need one for lunch, I remove it from the freezer and place it into my son's lunchbox. By lunchtime at school, it is defrosted and just perfect. These are also quite delicious on a hot summer day straight out of the freezer too! Over the years, this simple homemade hack has saved us so much money. I can buy a huge 40 oz jar of peanut butter and loaves of bread at my local Aldi very inexpensively. Then we have many, many of these easy-to-grab PB&J's at the ready for cheap anytime we need them. Oh boy! Do I have a yummy, yet super easy recipe to share with you all today. I introduce you to Slow Cooker Chinese Orange Chicken. I have several recipes for Chinese food I have cultivated at home over the years that have made it into our regular meal rotation, this is one of them. Now, total disclaimer, this is probably nowhere near authentic. But, I am not exactly going for authentic around here. Close to, but tasty and MOST importantly easy, is the end game. 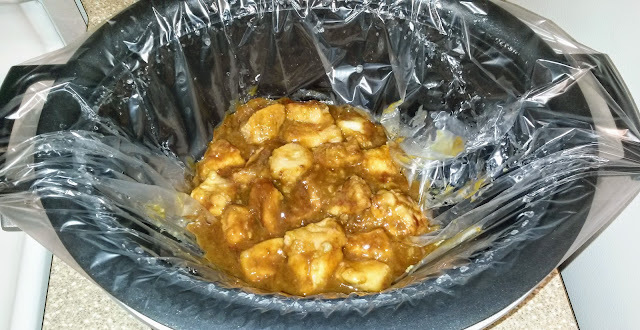 Place cut chicken into bottom of slow cooker. In a measuring cup, mix together balsamic vinegar, ketchup, OJ concentrate, water, salt, brown sugar, flour. Pour over chicken. 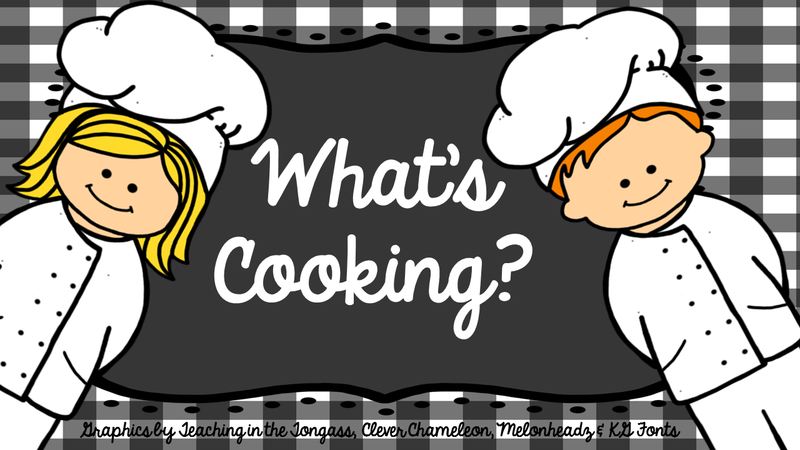 Cook on Low for 3-5 hours, depending on the cooking heat of your slow cooker. Stir chicken into sauce. Serve over steamed, white rice. This dish comes out tender with a thick tangy orange sauce thanks to the flour that was mixed in at the beginning of the cook time. I usually drizzle the excess sauce that's in the bottom of the slow cooker over the top of the rice. So tasty! Best of all, you can throw everything into the slow cooker and walk away. When it's dinnertime, presto, homemade Chinese with almost no work involved. And....we didn't have to wait on take-out or spend extra money. Total win in my book! My previous post was all about bulk prepping bell peppers and mushrooms for future use, resulting in saved time in the kitchen. 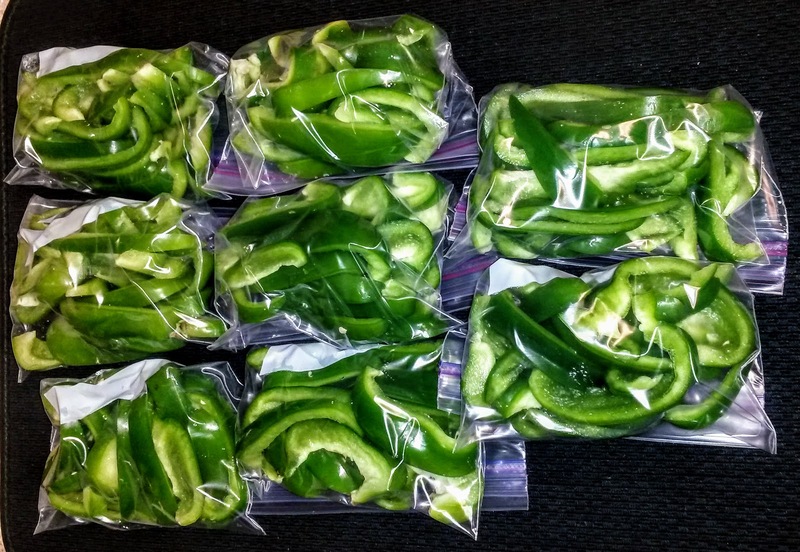 Today's post will use one of the ingredients we bulk prepped, green bell peppers. 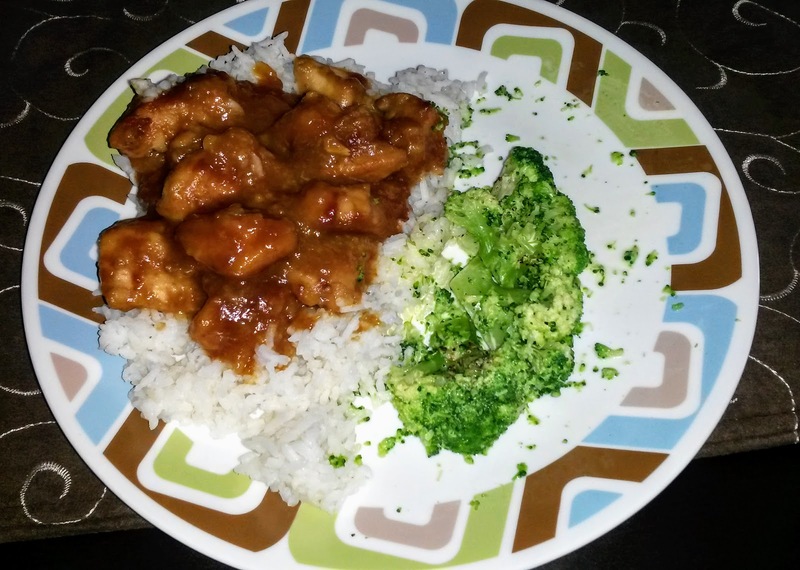 Pepperjack chicken is a very flavorful, yet easy main dish. It all starts with the ever versatile boneless, skinless chicken breast. It can easily be thrown together at any point in the day, refrigerated, and then baked before dinner time's arrival. Place chicken breasts into a baking dish. Season both sides of chicken with Cajun seasoning. 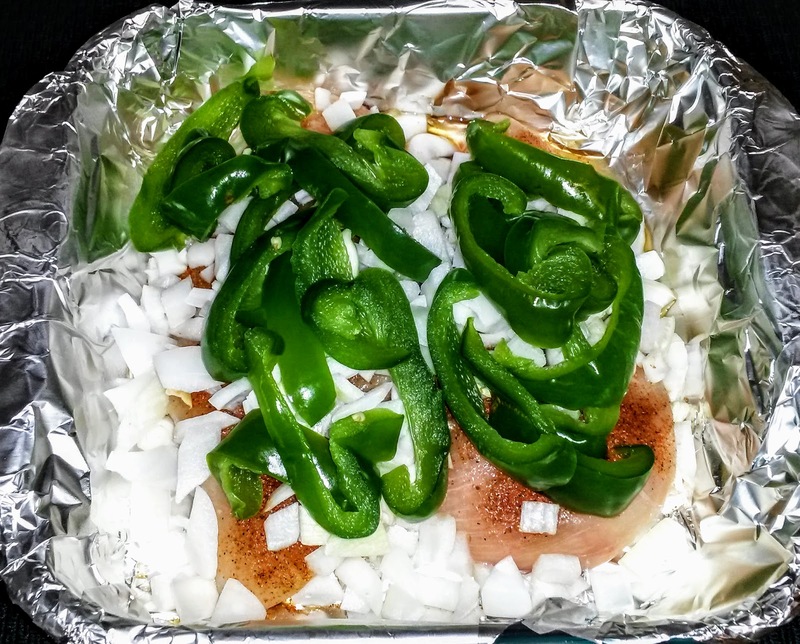 Top each piece of chicken with bell pepper and onions. Bake at 400 for 25-30 minutes. Remove dish from oven. 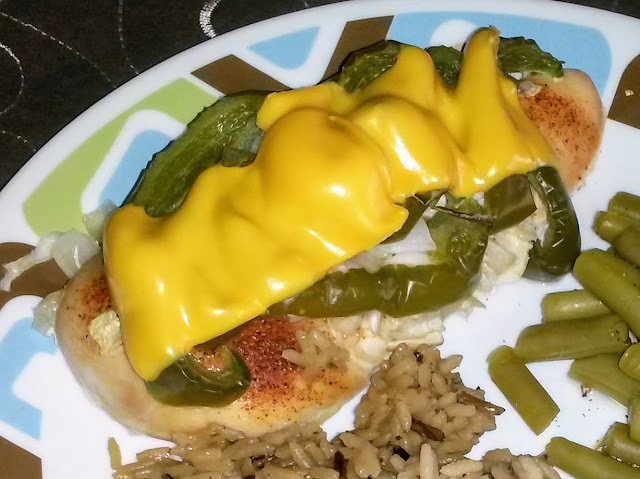 Top each chicken breast with a slice of cheese. Place back into the oven just until cheese is melted. This dish is very adaptable. You can use red bell peppers instead of green. You can also slice the onion or dice it. The cheese option is totally up to your preferences as well. I often use Pepperjack because we like the spiciness of it; but I have also used cheddar with great results. The chicken comes out tender, juicy and so flavorful. It is a great way to use up some of the "on-sale" green bell peppers from the freezer! One of the ways I work ahead in the kitchen is by bulk prepping foods to store in my freezer for later use. On this day, I worked with bell peppers and mushrooms. Bulk prepping ingredients is just as it sounds. It is taking a large amount of meal ingredients like vegetables, meats, cheeses, etc and processing them into usable portions. Often, I will find ingredients on sale and buy many of that item. When it is an ingredient we use often, we can save money using these items over time in meals. This simple principle allows me to further reduce the cost of meals for our family. Not only did I save money by buying on sale, but chopping them myself saves quite a bit of money over buying pre-packaged bags of chopped bell peppers in the grocery store's freezer section. It also saves me so much time in the kitchen. 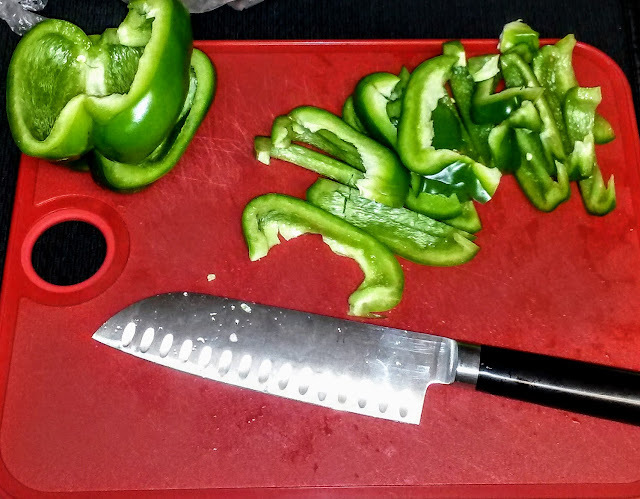 Instead of chopping up bell peppers every time I need one for a recipe, I can take 15 minutes and chop up many bell peppers! This saves time both in food prep but also in time it takes to clean up. I can easily pull a bag of something I previously chopped, cooked, or mixed together from the freezer to add to meals throughout the month with no added hassle or work. To process the bell peppers, begin by removing the internal ribs and seeds. Then slice or dice the peppers into a form you can use in future recipes. 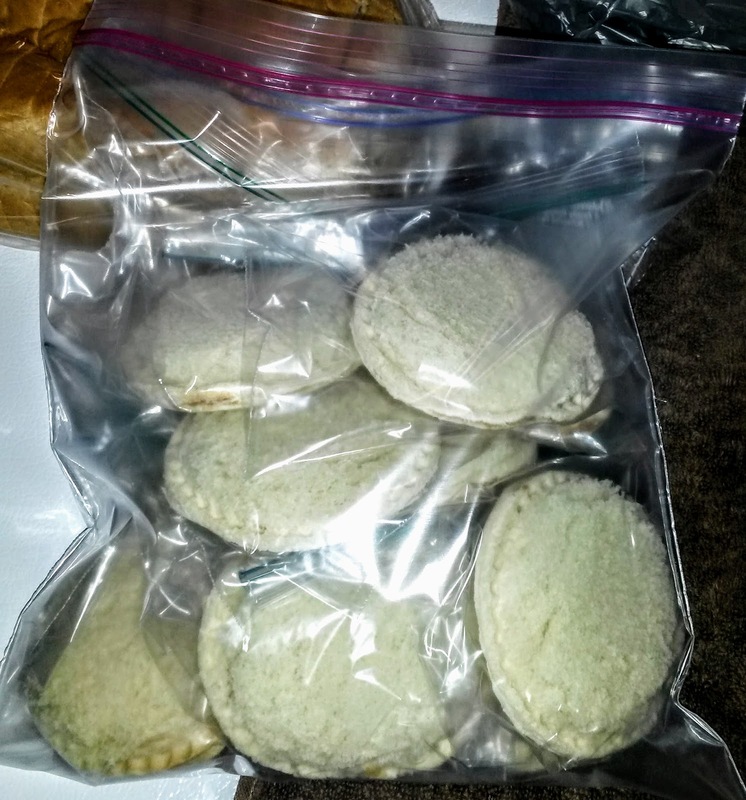 Place a single meal portion into a quart sized freezer bag, pushing as much air out as possible. Then tightly seal bag closed. I then place all of the quart sized bags into a gallon sized freezer bag to keep things together in the freezer for ease of finding later. Bulk prepping mushrooms is much the same as with the bell peppers above. In this case, I used already sliced mushrooms; but you can also use whole mushrooms that you slice yourself. 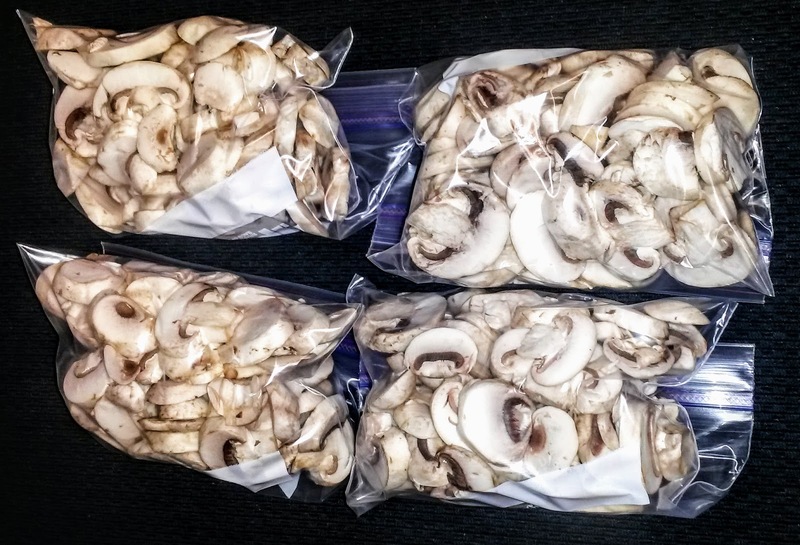 Then just package up the sliced mushrooms in bags as described above. Because these vegetables have been frozen, these will not be edible raw. They will need to be used as an ingredient in meals and cooked. Freezing these types of vegetables makes them take on a soft texture, therefore they will not have the same "bite" or crispness as they do fresh. These pre-prepped foods make a great addition to slow cooker meals, casseroles, stir-fry's, and soups. I have many recipes that use these ingredients that I plan to share soon! Welcome to my blog! Here at A Welcome Kitchen I will be sharing the many recipes, kitchen tips, meal plans and freezer cooking adventures that have been simmering for quite some time. I am so excited to share what I have learned with all of you. A little about me: I have been married to my patient and amazing husband for 12 years. We have one son who just recently turned 8. We also have 3 cats, we are a cat-loving family for sure. I was born and raised in Southern California, but relocated to the Midwest. I am an accountant by trade, but turned in my calculator for an apron when we had our son, becoming a Stay-at-Home Mom. When I was in high school, I took one year of Home Ec. I enjoyed the class, mainly when we would be learning a new recipe and cooking from scratch. I can remember a couple of recipes that my friends and I would get together and make on our own after class. I should have known that recipe creation was my calling way back then! I just truly enjoy creating yummy new things for my family to try. The days that I get to just putter around in my kitchen working on food prep and cooking are some of my happiest and most fulfilling. 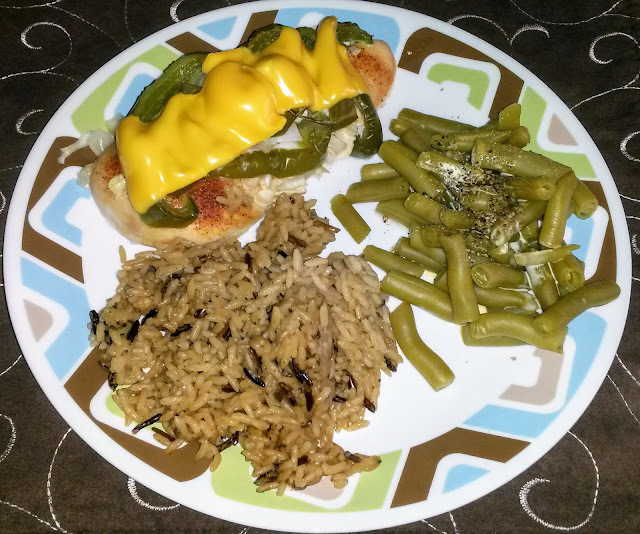 Being a Stay-at-Home Mom / Homemaker has required me to find ways of making easy, tasty, and frugal meals. Because there is always a list of other things that need done, all before school pickup time arrives. These time saving tips are just some of the things I will be sharing here to help other Mom's maximize their time in the kitchen too. I hope you enjoy visiting and come back often. I appreciate readers and love hearing from each and every one of you. So, don't be shy, leave me a comment and let's start engaging in some helpful conversations.